As Tunisia in turmoil after President Zein al-Abidine Ben Ali fled the country, Western media suggest WikiLeaks founder Julian Assange might have pulled the trigger on the dramatic developments. ­Tunisian citizens have been staging anti-government protests over soaring unemployment and corruption. At least 42 inmates were killed in two prison fires on Saturday in the resort city of Monastir. Violence came to the capital Tunis as the speaker of the parliament, Foued Mebazaa, took over as interim president on Friday. He tasked Prime Minister Mohammed Ghannouchi, who earlier said he was in temporary charge, to form a national unity government. In a televised address, Mebazaa promised he would see to it that all political parties will be consulted. Under the country’s constitution, a new presidential election must be held within 60 days. The interim government has declared a state of emergency and imposed a curfew in Tunis. 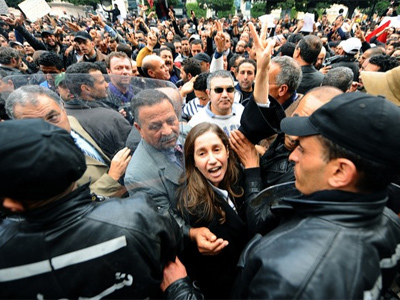 Discontent over Ben Ali’s autocratic and corrupt rule has been growing for years now. He came to power in a bloodless palace coup in 1987, taking over from his predecessor Bourguiba, termed ”President-for-Life”, who had ruled the country since its independence from France in 1956. Ben Ali was last re-elected in 2009 for a five-year term with 89 per cent of the vote. A recent release of US diplomatic cables by WikiLeaks is said to have been the last straw. The documents called Tunisia a "police state", describing the president and his family as a mafia. “Of course, Tunisians didn't need anyone to tell them this. But the details noted in the cables – for example, the fact that the first lady may have made massive profits off a private school – stirred things up. Matters got worse, not better (as surely the government hoped), when WikiLeaks was blocked by the authorities and started seeking out dissidents and activists on social networking sites,” Foreign Policy magazine wrote on Saturday. Britain’s Guardian and Daily Mail make similar suggestions. The publication fired up the nation’s disaffected youth. Riots began a month ago, spreading quickly across the country. Concessions the ousted president tried to make were not enough to calm the protestors down. As a result Ben Ali had to leave. He is now said to find temporary refuge in Saudi Arabia. ­The Arab League has called “for all political forces, representatives of Tunisian society and officials to stand together and unite to maintain the achievements of the Tunisian people and realise national peace," Reuters reports. The organization urges the country to reach a "national consensus on ways to bring the country out of this crisis in a way that guarantees respect for the will of the Tunisian people." Arab League Secretary-General Amr Moussa told journalists on Saturday that the situation in Tunisia will be discussed during the League's economic conference in Egypt due to take place on January 16-19. Head of the Russian Federation Council’s Committee for International Affairs Mikhail Margelov stated on Saturday that the United Nations, OSCE, the Council of Europe and other international organizations have to do their best to help get the political situation in Tunisia back to normal. “It is a strategically important country of North Africa, and today it is one of the leaders of the Arab world. So it is essential for both the EU and the Arab world that Tunisia does not slide into religious fundamentalism,” RIA Novosti quoted Margelov as saying. US President Barack Obama said he admired the courage of Tunisian protestors, and urged all parties to keep calm and avoid violence. ­Russian travel agencies have decided not to send tourists to Tunisia and are ready to pay out compensations to the clients. On Sunday a Transaero plane will evacuate Russian citizens who are now in the country. However, many Russian tourists are unwilling to return to their homeland ahead of time, Echo of Moscow radio reports, quoting a Tunisian travel firm. The Russian Embassy in Tunisia says it is closely following the developments in the country. "We have seen no reports about unrest, demonstrations, or riots in the resort areas. About 200 Russian tourists are staying in the country now. The diplomatic mission has not received reports about incidents with them in Tunisia," embassy spokesman Alexander Linnik told Interfax on Saturday.